Bethesda's new The Elder Scrolls V: Skyrim role-playing game is off to an excellent start as shipments hit the 7 million mark after just five days. The publisher estimates that over 50 percent of launch units were sold in the first 48 hours, and notes its been receiving large reorders from major retailers in North America, Europe and Australia. ZeniMax® Media Inc. today announced that Bethesda Softworks’® award-winning title, The Elder Scrolls V: Skyrim, has enjoyed an enthusiastic reception by gamers across the globe. 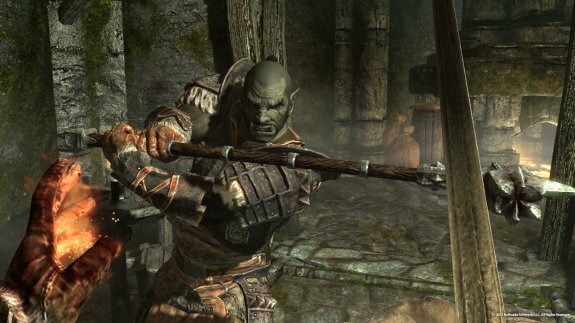 After shipping seven million units of Skyrim for the Xbox 360® video game entertainment system from Microsoft, PlayStation®3 computer entertainment system, and PC, Skyrim’s launch units are expected to generate more than $450 million in global retail sales. With tens of thousands of fans lining up at retail outlets at midnight on 11/11/11 to purchase the game, Skyrim continued to record strong sales following its release. More than 50% of launch units were sold in the first 48 hours and Bethesda Softworks has been receiving large reorders from major retailers in North America, and across Europe and Australia. Online activity has been notable, with Steam reporting that in the first 24 hours of its release, Skyrim set a record with over 280,000 concurrent players, far outdistancing all other titles. Developed by Bethesda Game Studios®, the makers of the 2006 Game of the Year, The Elder Scrolls IV: Oblivion®, and 2008 Game of the Year, Fallout® 3, Skyrim reimagines and revolutionizes the open-world fantasy epic, bringing to life a complete virtual world for you to explore any way you choose. If you haven't picked up Skyrim yet I highly recommend it, it's one of the best games I've played in quite a while.